Meyers, Cindy: The Macaron and Madame Blanchez. In: Gastronomica. The Journal of Food and Culture, Vol. 9, No. 2 (Spring 2009), pp. 14–18, University of California Press, online. Frances Crawford. Macarons. French confectionary adapted for English families. 1853. ^ Henry, Liz. Eats: Food quest — Paradise found: The search for the elusive macaron pays off.. Sun Journal. 2 May 2010 [10 May 2012]. ^ 4.0 4.1 Macaron vs Macaroon. Foodpr0n.com. 26 February 2010 [8 July 2012]. ^ Macarons, Macaroons, Macaroni. The curious history. Slate Magazine. （原始内容存档于2013-10-13）. ^ Nick Rider. Short Breaks Northern France. New Holland Publishers. 1 May 2005: 135. ISBN 9781860111839. ^ Press book, Musée de l'Amande et du Macaron, see article La Maison Rannou-Métiviere, July/August 2003. ^ Hubbeling, Christina. Wer macht die besten Macarons? (Who makes the best macarons?). Neue Zürcher Zeitung. Neue Zürcher Zeitung AG. [3 March 2014]. ^ Luxemburgerli. Confiserie Sprüngli. Confiserie Sprüngli AG. [3 March 2014]. ^ Böhler, Guido. Macarons: wer macht die besten und schönsten? (Macarons: who makes the best and most attractive ones?). delikatessenschweiz.ch. foodaktuell.ch. [3 March 2014]. ^ Malgieri, Nick. 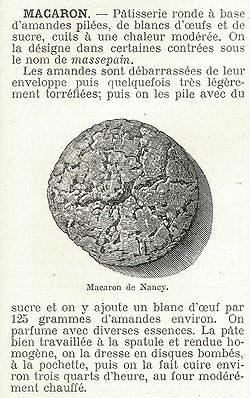 Baking : How to Make a Macaroon. Los Angeles Times. [3 March 2014]. ^ Gasser, Benno. Auf der Suche nach dem besten Zürcher Macaron (The search for the best Zurich macaron). Tages-Anzeiger. Tamedia AG. [3 March 2014]. ^ Kummer, Corby. Smackaroon! The Switzerland vs. France Cookie Smackdown. The Atlantic. The Atlantic Monthly Group. [3 March 2014]. ^ Cha, Daniella: "Macarons: The New Trend for Desserts." Phoenix Plume. The official newspaper for Korea International School, 27 April 2011. Retrieved 8 December 2012. ^ 마카롱,마카롱만드는법. Naver. 7 August 2011 [8 May 2012] （韩语）. ^ 24.0 24.1 24.2 Jargon, Julie. Mon Dieu! Will Newfound Popularity Spoil the Dainty Macaron?. The Wall Street Journal. March 2, 2010 [December 29, 2010]. ^ Reed, M. H. Macaroon Delight. The New York Times. January 29, 2009 [December 29, 2010]. ^ Denn, Rebekah. French macarons are sweet, light and luscious. The Seattle Times. October 25, 2009. ^ Greenspan, Dorie. Macarons: New to The Easter Parade This Year. Los Angeles Times. April 1, 2010 [December 29, 2010]. ^ Move Over, Cupcake: Make Way For The Macaroon. NPR. February 12, 2010 [December 29, 2010]. ^ eggzmacaron. Il est difficile de résister à atteindre pour un autre!. （原始内容存档于2015-08-01）. ^ Chavassieu, Olivia. Heaven on Earth. Sydney Morning Herald. [7 March 2012].